Monument signs are one of the most durable, versatile, weather-resistant, and cost-effective exterior signs. Along with being large, low to the ground, and highly noticeable, they are fully customizable. Monument signs can be cut into various shapes, they can be outfitted with LED lights, readerboards, and illuminated channels, they can feature metal cut lettering, and they can even combine the architectural beauty of their solid structure with attractive graphics. To put it simply, monument signs are one of the best sign options available. 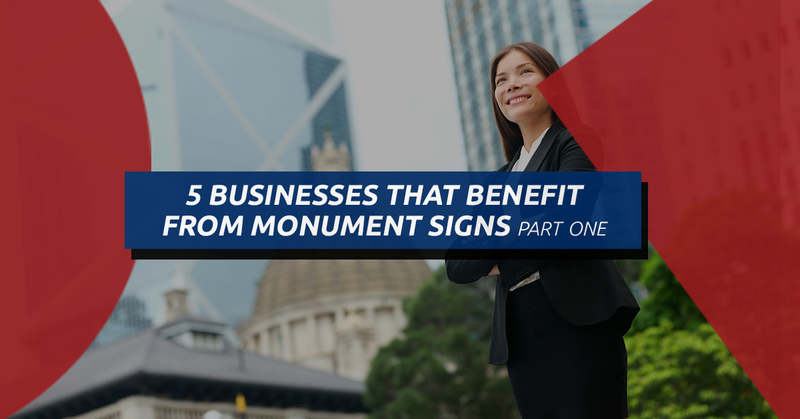 Today, the friendly sign experts at Sign Central will share with you some of the top businesses that can benefit from monument signs. Are you ready to create a custom sign for your business? Contact your Top Rated Local® Arlington signage company to get started. One of the most common places where monument signs are seen is at churches and other religious centers. Having a large, breathtaking, and easily noticeable sign that adds character to the property is a great way for people to find your location. Additionally, these signs are ideal for placing in garden or flower bed typically found on lawns of churches. Monument signs are excellent wayfinding devices, which is why they offer significant value for business parks with multiple tenants. Having a large, attractive sign that can be easily noticed due to its ground-level placement enables passersby to spot the sign since it’s in their direct line of site. What’s more, these exterior signs offer a lot of space to work with, which can include the business park name, different addresses for multiple buildings, and more. Monument signs are made from materials that can be fabricated in artistic and attractive ways. These signs are ideal for subdivision entrances and neighborhoods as location markers and wayfinding devices. They add a touch of architecture and style that can make a neighborhood look more attractive to existing and future residents. Schools benefit from non-illuminated and illuminated channel monument signs for a variety of reasons. These exterior signs can be fabricated to be massive masonry signs that feature both lettering and graphics to show the school’s logo. These signs can also feature LED readerboards that advertise significant dates and events such as school closures and sporting events. Monument signs are also ideal for corporate offices because they can showcase the company’s brand, address, and more. These signs are an effective way to amplify a business’s marketing message, as well as functioning as a landmark and navigation tool for visitors. Start Your Exterior Sign Project Today! If you think your business, nonprofit, or school could benefit from a monument sign, reach out to Sign Central to start a custom sign project. We are a full-service Arlington sign company with more than 25 years of experience in creating attractive signage for local Chicagoland businesses just like yours. Along with designing and fabricating your sign, we can also acquire the necessary permits and handle the installation of your sign. Call us today or reach out to us online to get started on your next sign project!